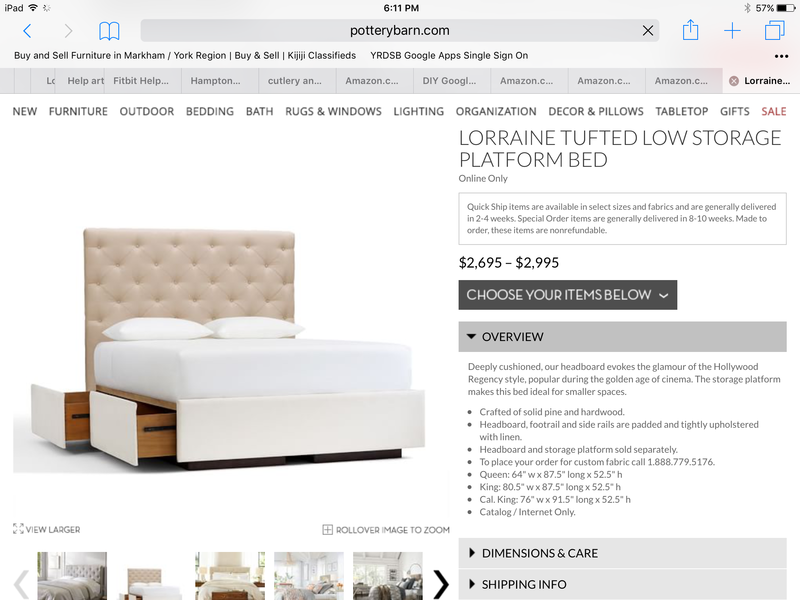 My dream bed… Finally | ARTZCOOL'S BLOG! Ok, I know I haven’t posted in a while. I have a whole line up of projects to share! 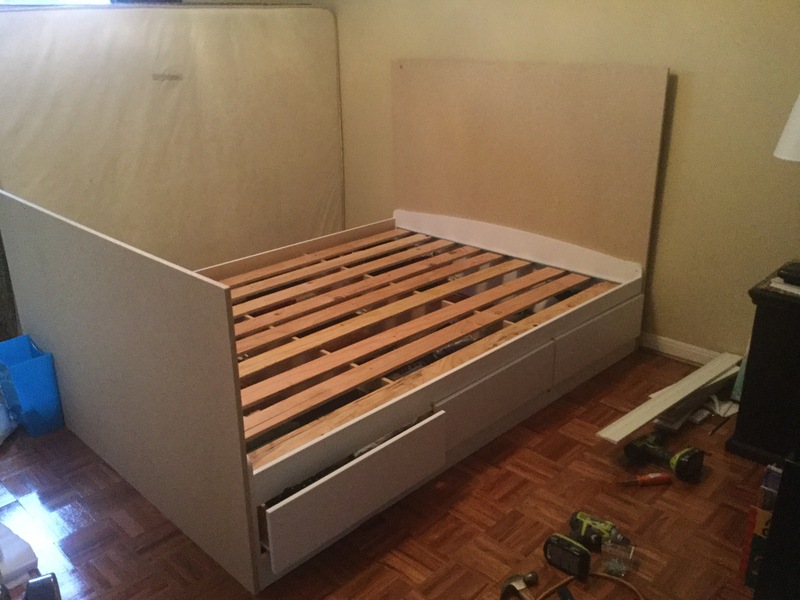 I am really happy with the way my bed turned out, so I decided to start by sharing how I finished my new bed. There are lots of steps, so I tried to keep the words short and share lots more pictures. 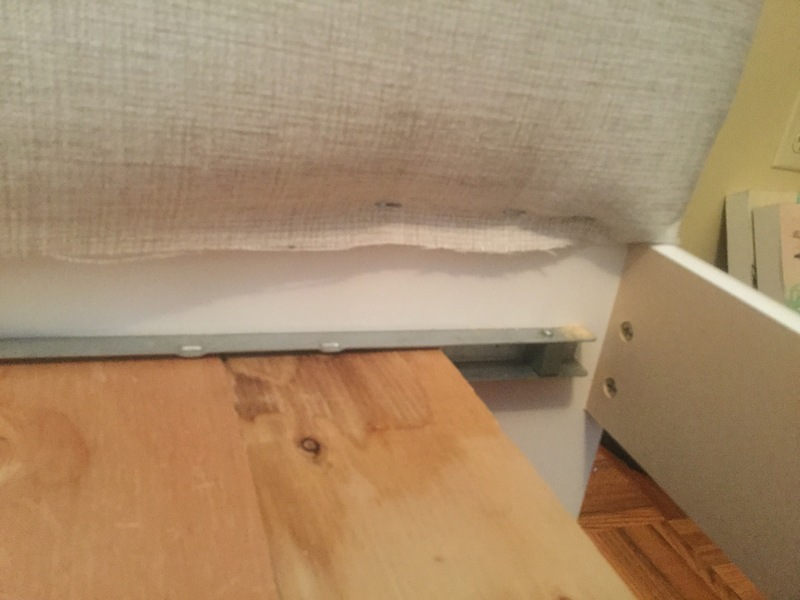 Since we moved into our house five years ago, the bed in our spare room has been on the floor with a headboard propped up behind it… I know, what have I been doing with all of my time, right? It is one of the last rooms in the house we haven’t touched. 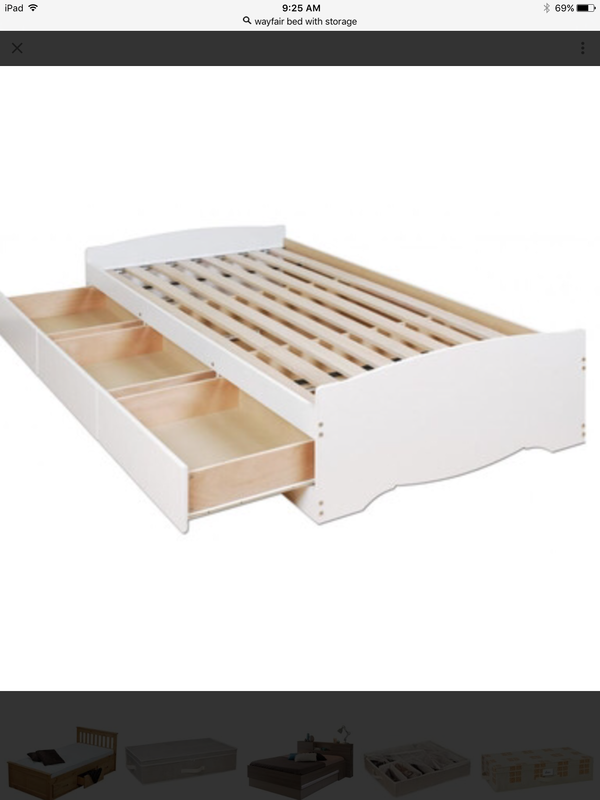 Anyways, I have been looking for a bed with storage for years, and here is the one I settled on.. Unfortunately, the $3000 price didn’t work for me. 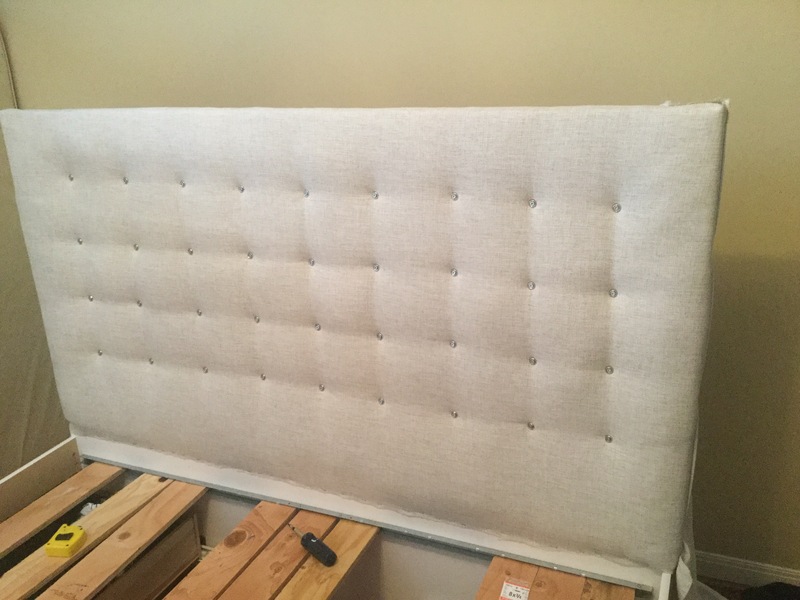 But, I wanted a bed with storage, AND a tufted headboard, which instantly made it a really difficult and expensive item to find. 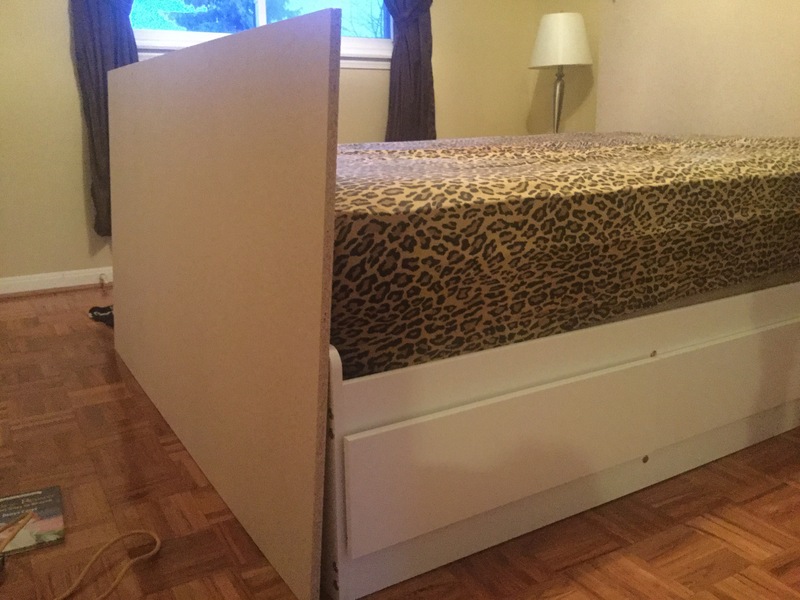 So instead I bought this cheap laminate bed for $250. What I liked about the cheap bed was all of the storage. Here is what it looks like after I put it together. It fits all of my summer clothes! But… Still not quite like the one I wanted. 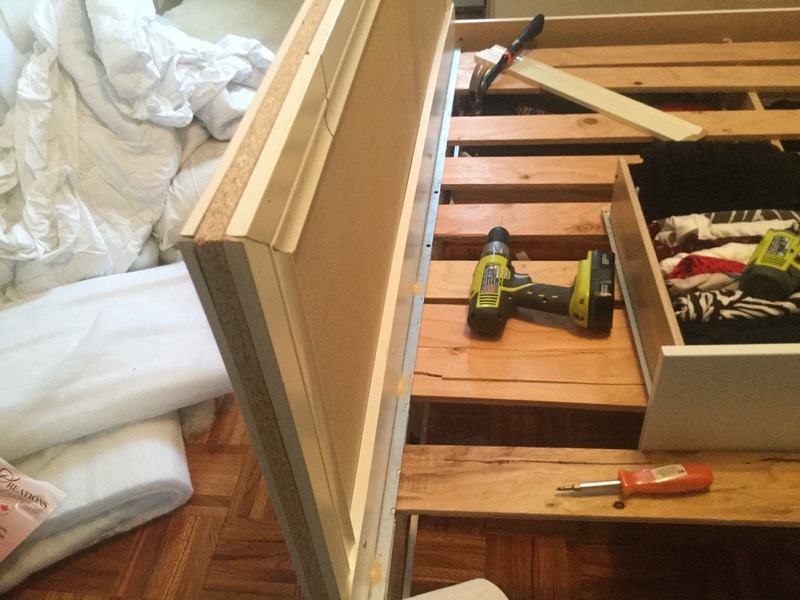 The first step in the transformation was to actually add a headboard and footboard. I measured the width of the bed, and went off to Home Depot. 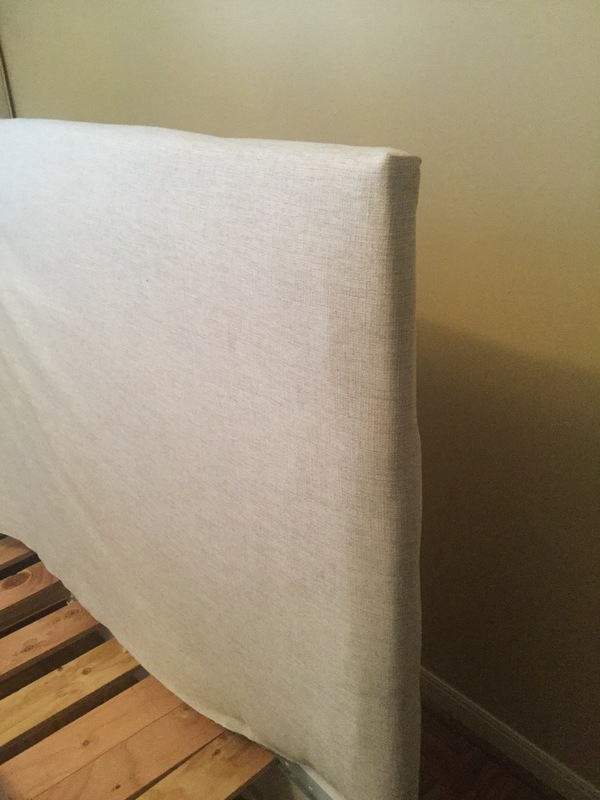 I wanted the head board to be 60″ high, but I ended up settling on 48″ because that was the width the 3/4″ particle board sheets are sold in, and plus I figured out that a 60″ sheet wouldn’t fit in my car. So I had the wood cut at the store. 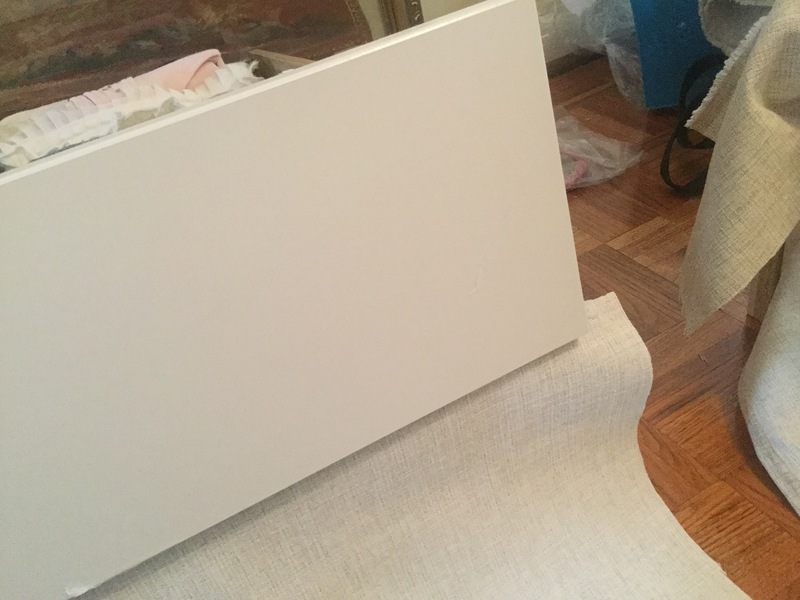 The piece for the headboard was 62″ x 48″, and the footboard was 62″ x 35″. 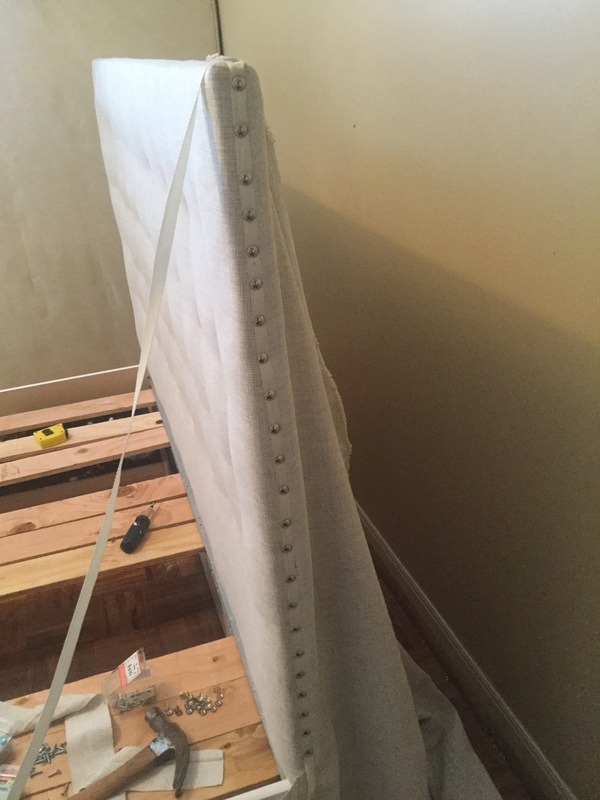 I pre drilled the holes then used 1 1/4″ screws to attach the headboard and footboard to the frame. I added a few screws from each side. So far so good. But then there was the issue of the joint showing, as you can see below. 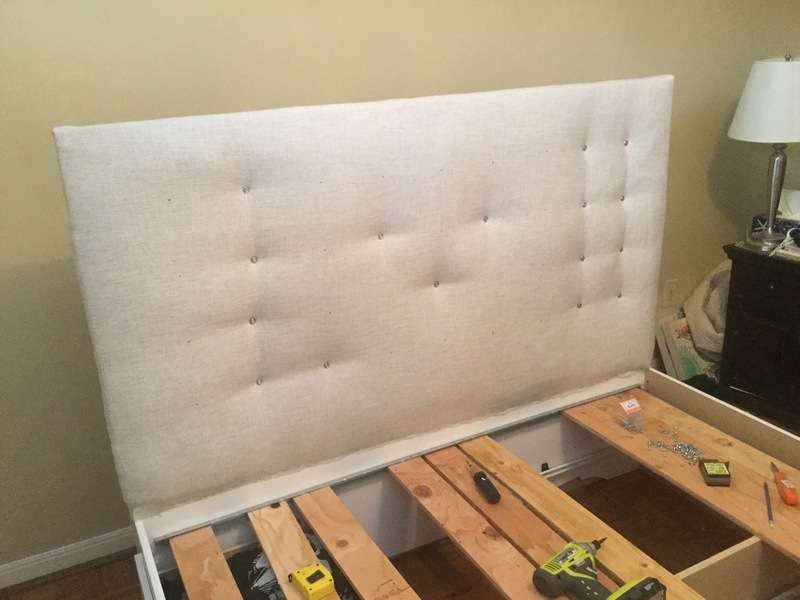 Also, the headboards I was looking at were a lot thicker. 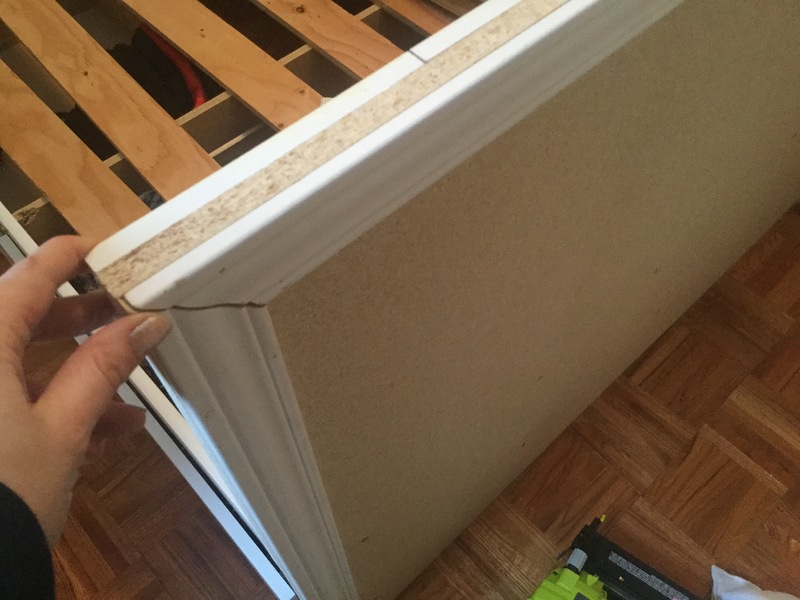 So for the footboard, I found some scraps of trim to use to frame around the edges and make them thicker. The great part is that the corners and joins didn’t have to line up perfectly because it is going to be covered anyways. 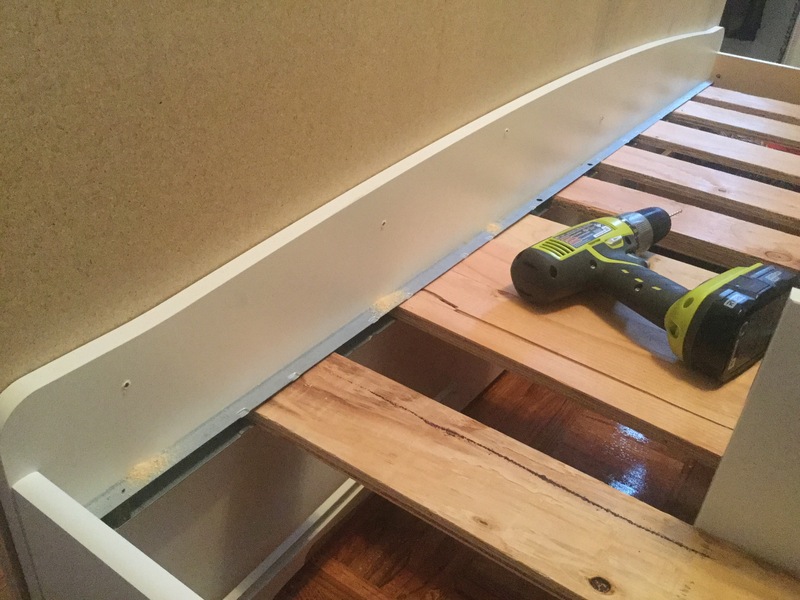 I used my nail gun to attach the trim to the front and back of the footboard. 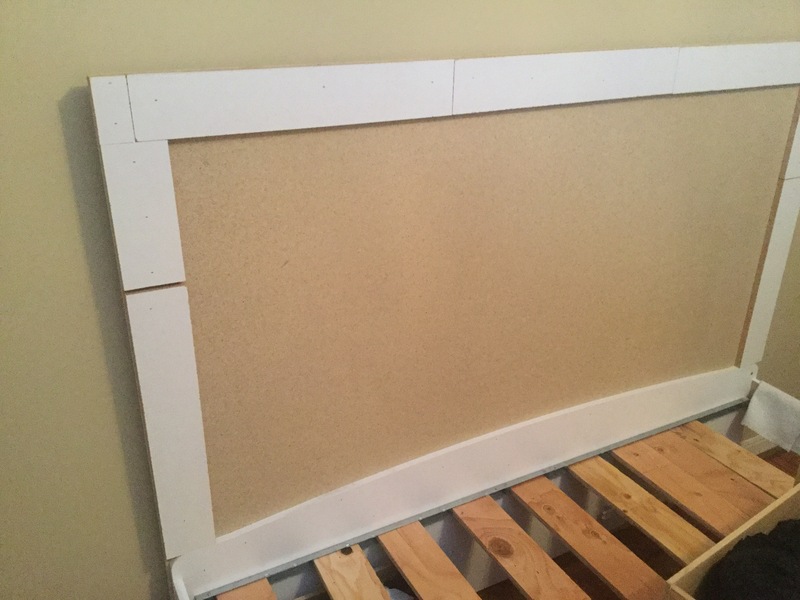 And, I used scraps of particle board for the front of the headboard. 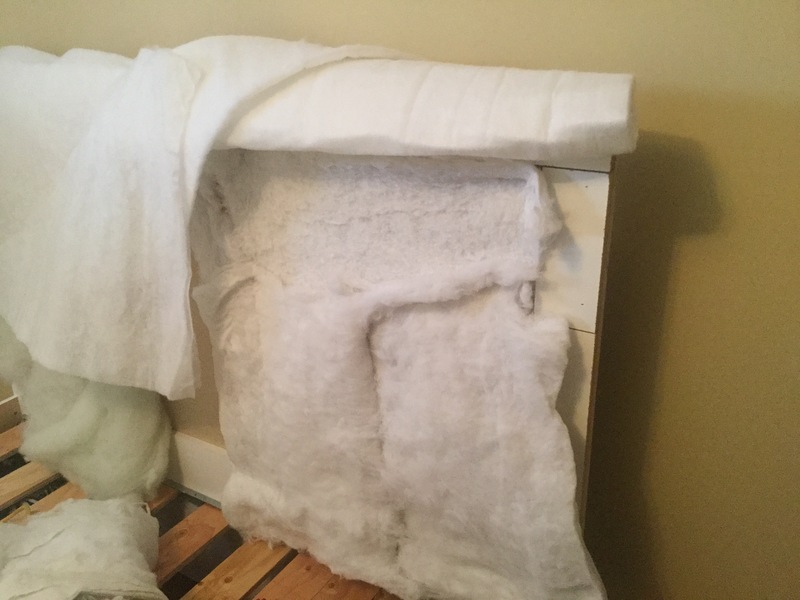 I figure I wanted the padding to be a little more on the headboard. Now for the fun part! 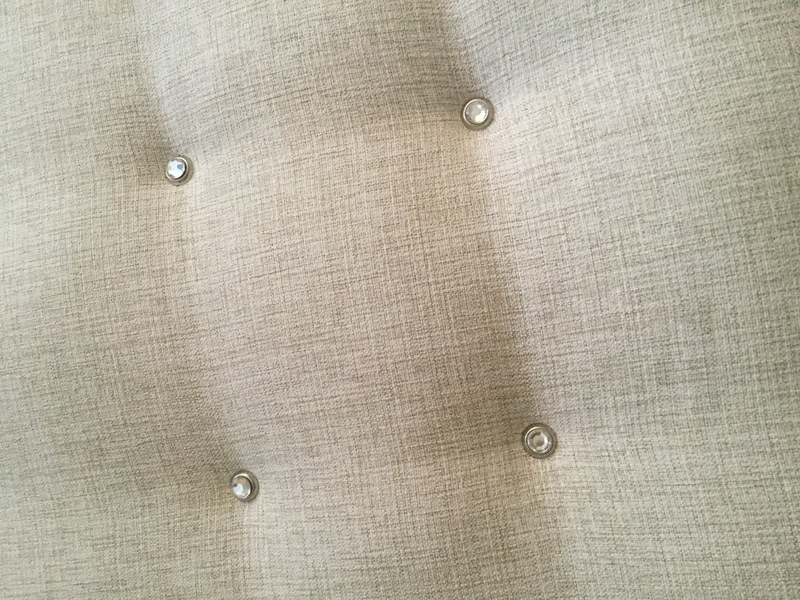 The upholstering! Btw, I am well aware that sometimes my definition of fun does not match everyone else’s! 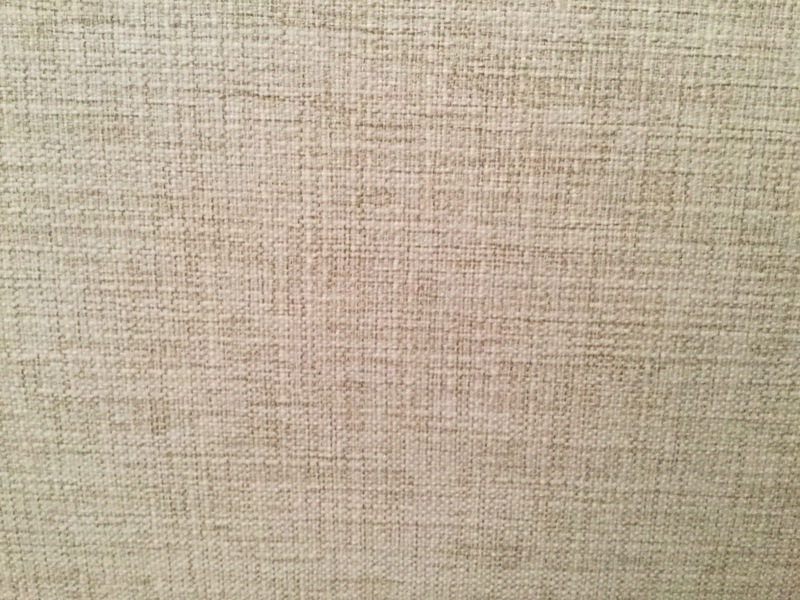 Here is the close up of the fabric I picked. I bought 8 meters at $8.00 per meter at Fabricland. I started by ripping apart a few old pillows I had laying around. The cost of cotton batting is pretty expensive, so once again, my inability to throw old things out paid off! 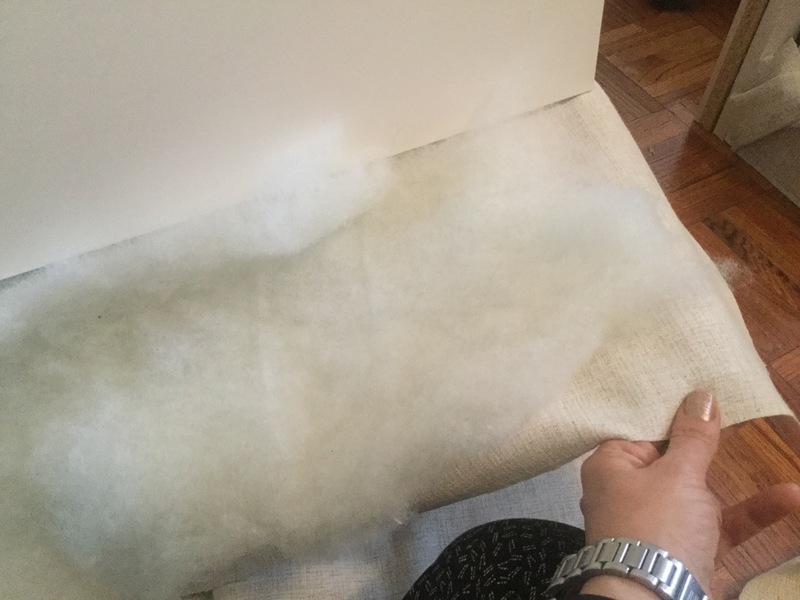 I’m not quite sure why I wasn’t able to throw out our old, flat pillows when we buy new ones, but every time I use something I have saved, it just reinforces my hoarding habits. It saved money, plus is much more environmentally friendly. 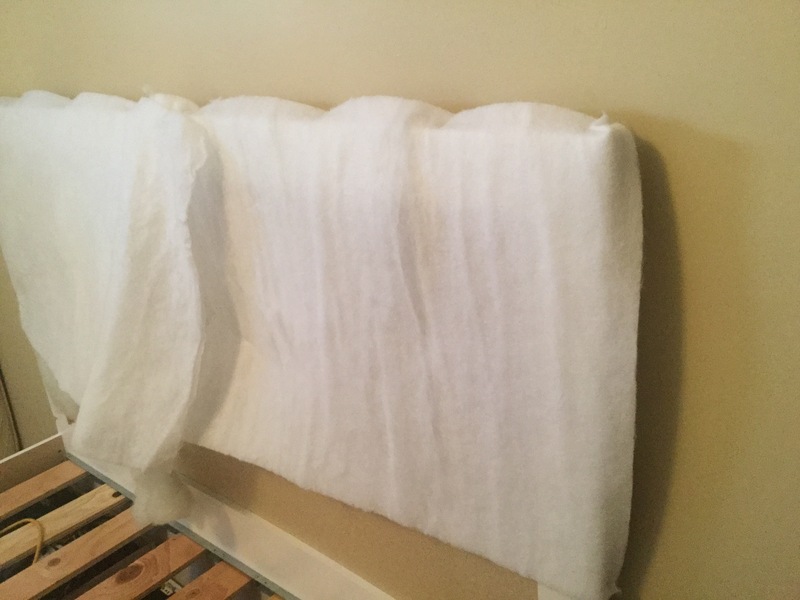 I used my staple gun to hold everything in place, and added a layer of cotton batting on the top to smooth everything out. 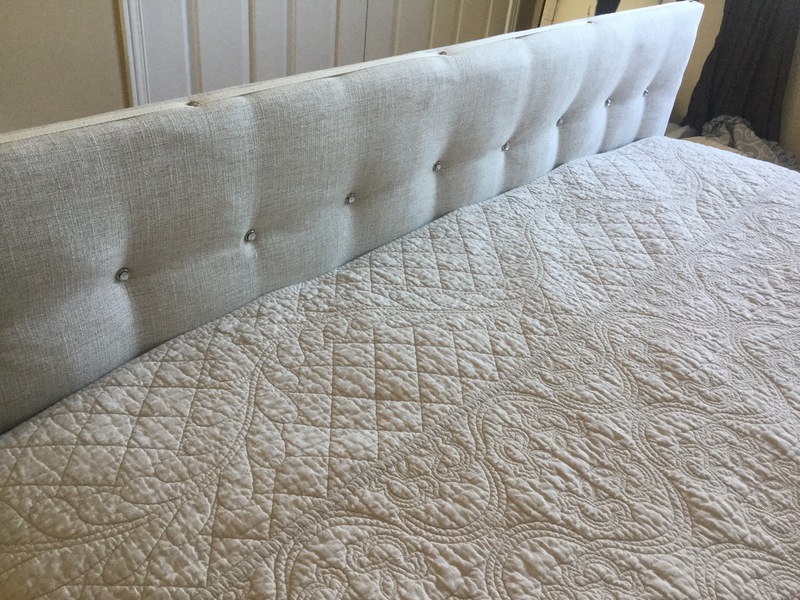 I stapled the fabric on the back of the headboard, and stretched it not too tight because I knew I was going to need a little extra room for the tufting. I finished the corners by tucking the extra fabric under. And, stapled all the way around to hold everything down. This is what it looked like …. 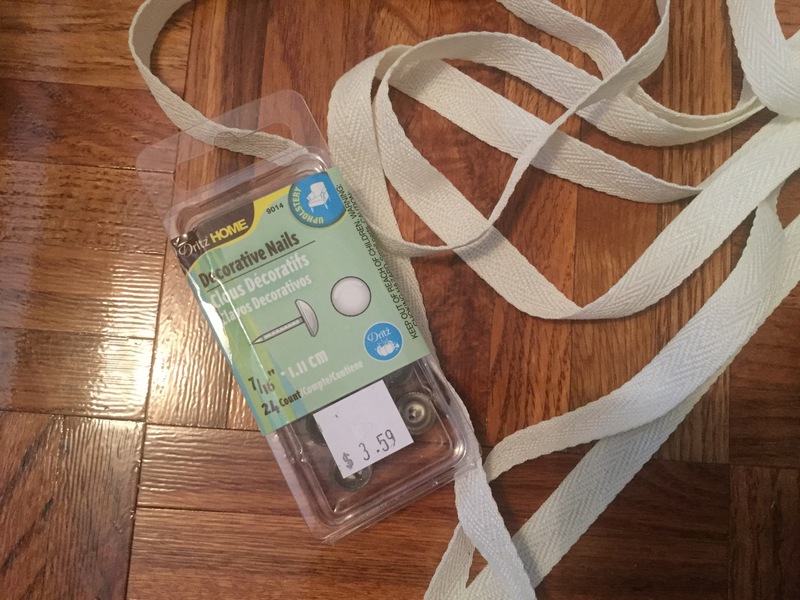 Here is the most amazing idea… I looked at the cost of covered buttons, and they are close to $1.00 each, plus you have to cover them! So that option was out. 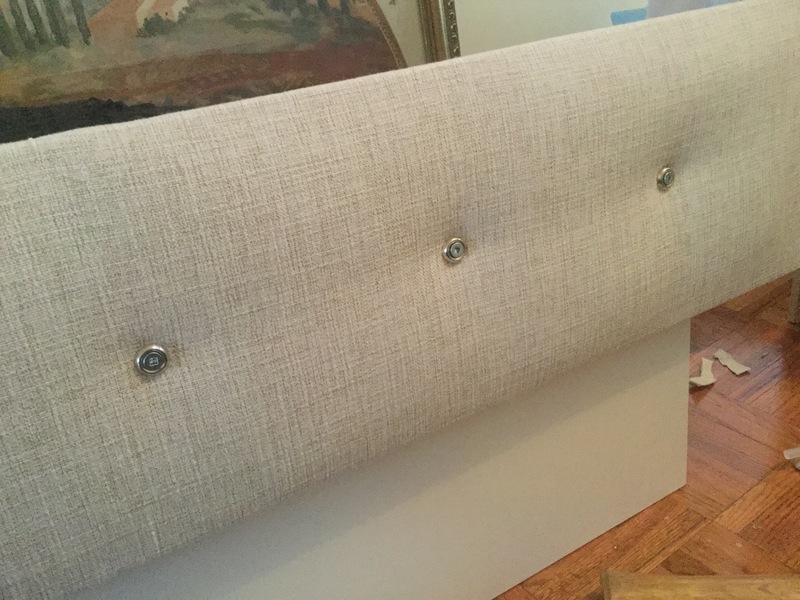 Buying silver buttons was another option, but it meant that I would have to pre drill holes in the particle board and use a big upholstery needle the thread each one through, after I had added the padding and fabric. That didn’t sound like fun. 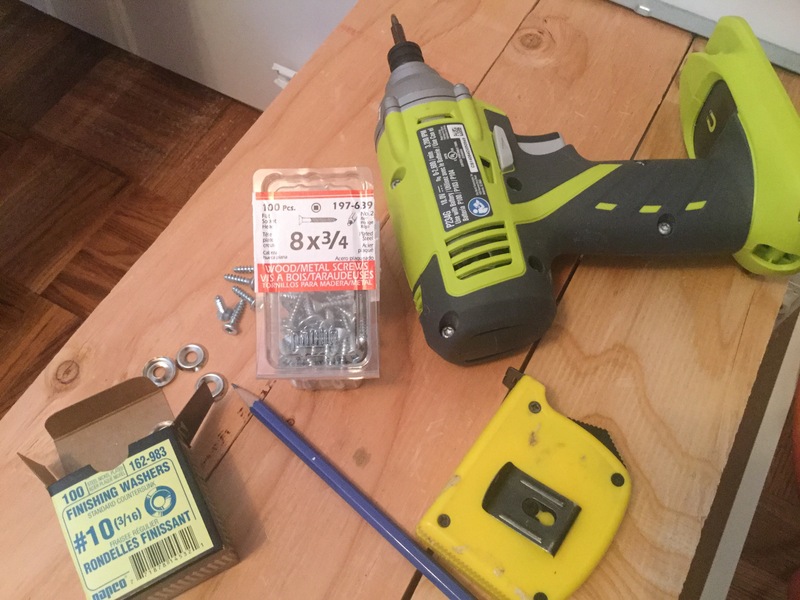 So I went to Home Depot (yes again) and bought a pack of 100 washers, and 100 3/4″ screws for about $3 per pack. This is one of those rare times that I do measure. Every 6 inches I measured, and drew a dot with a pencil. 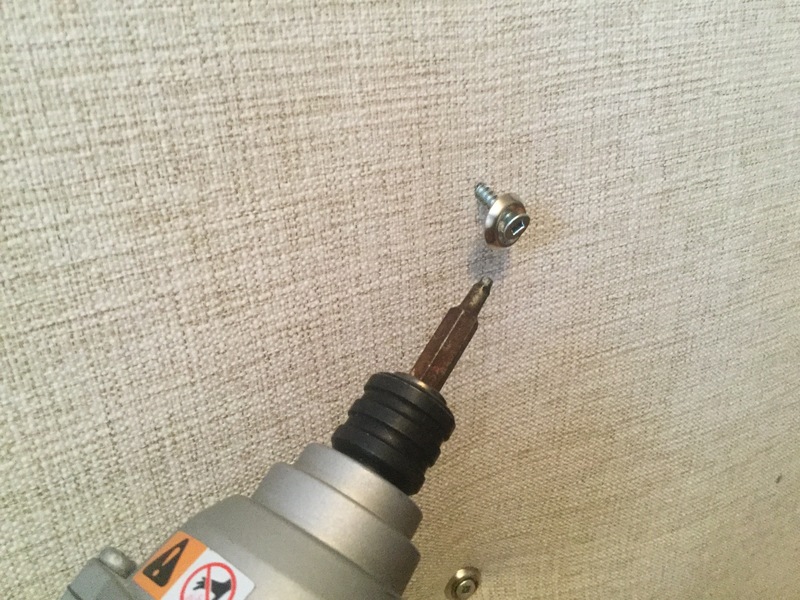 Once I had measured everything, I used my drill to screw in all of the screws and washers. 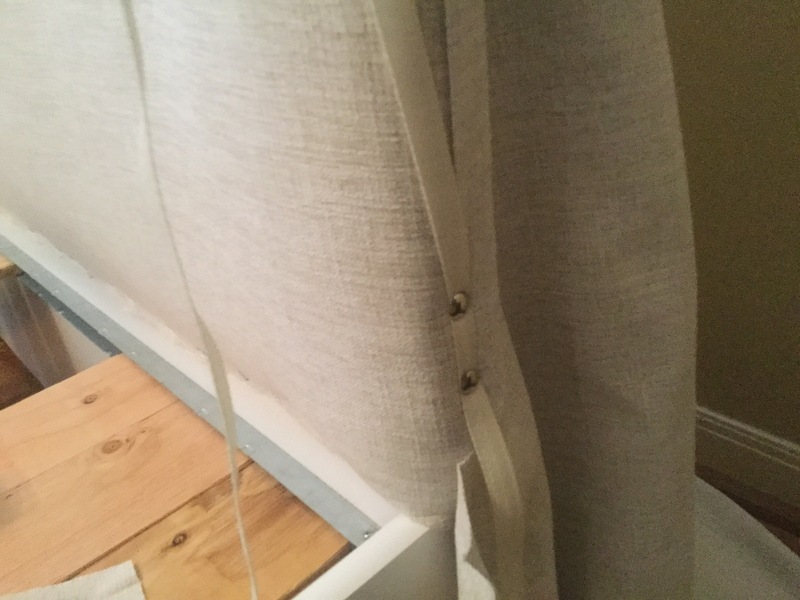 I started to work from one end, but then thought it might be better if I evenly stretched the fabric, so I started randomly adding the screws. Tada! 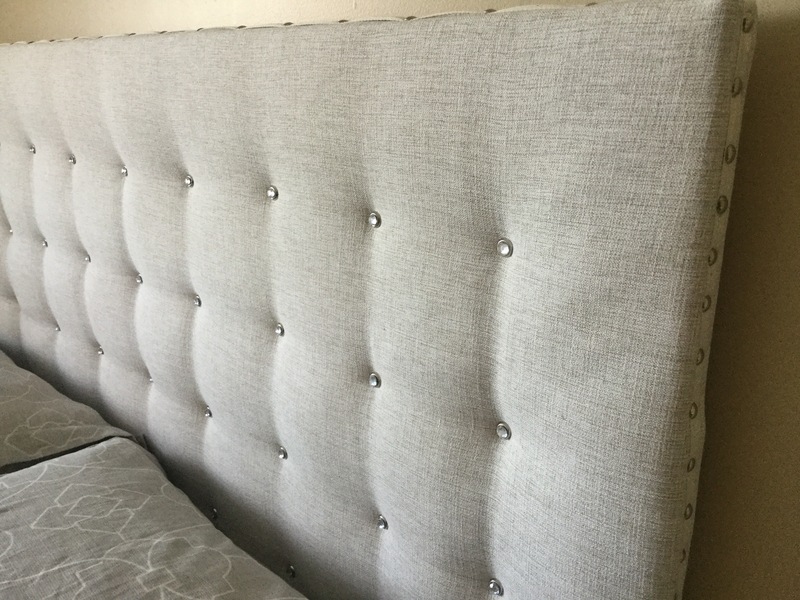 The whole headboard tufted in not too long, for only $6! Then, to add a little bling, and cover up the screw heads, using my glue gun, I added a little stick on gem from the dollar store. I am so happy with the way the tufting turned out! Next step was to add the nail heads. They are the one thing I splurged on. A pack of 25 costs $3.50 at Fabricland. I figure I need a few hundred. 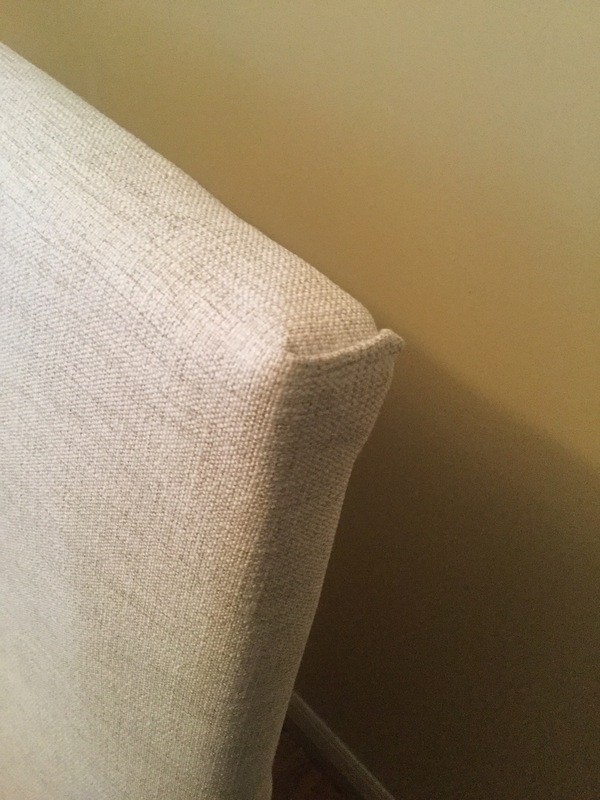 I added a twill tape to cover up the seams, and added a nail head every inch and a half. 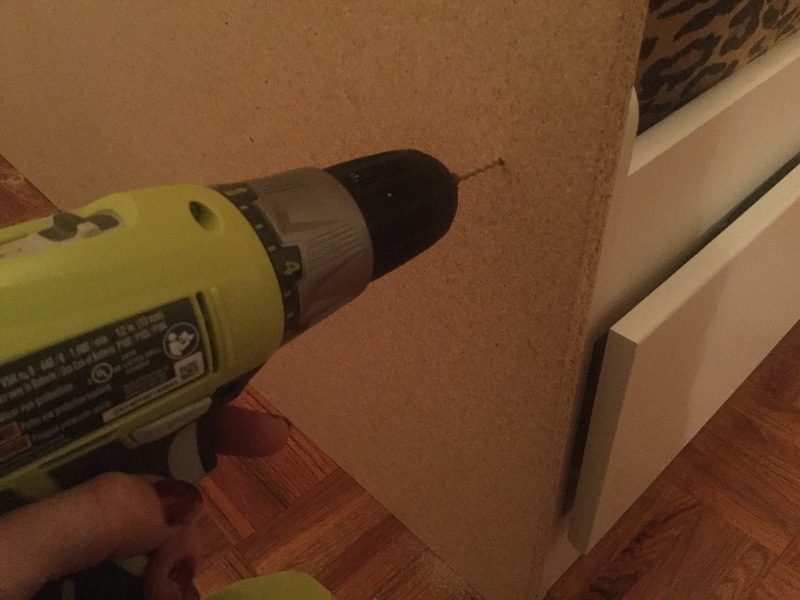 I actually measured this too, if the nails aren’t even, it would show. I will just gloss over the next few steps, but if you want details or pics, please email me, I am happy to share! 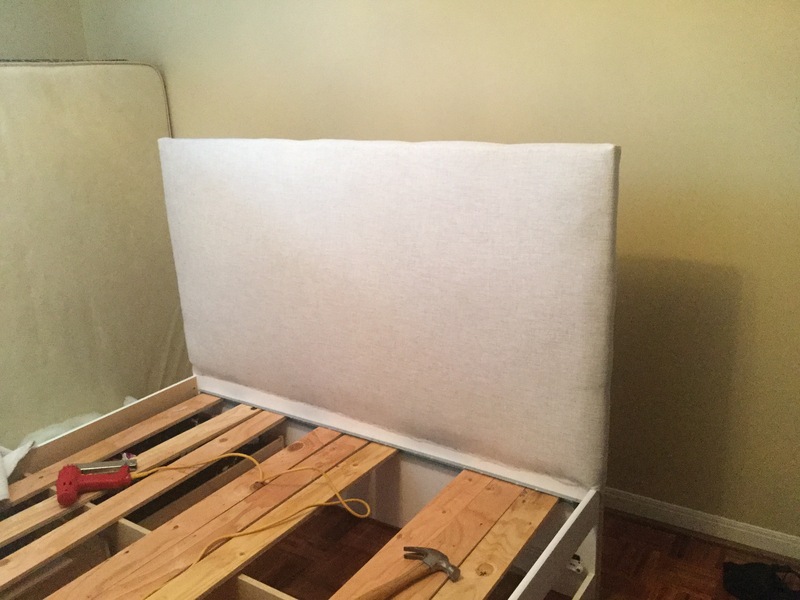 I covered the rest of the frame of the bed, the footboard, and upholstered each of the drawers, with a little but of padding and tufting. 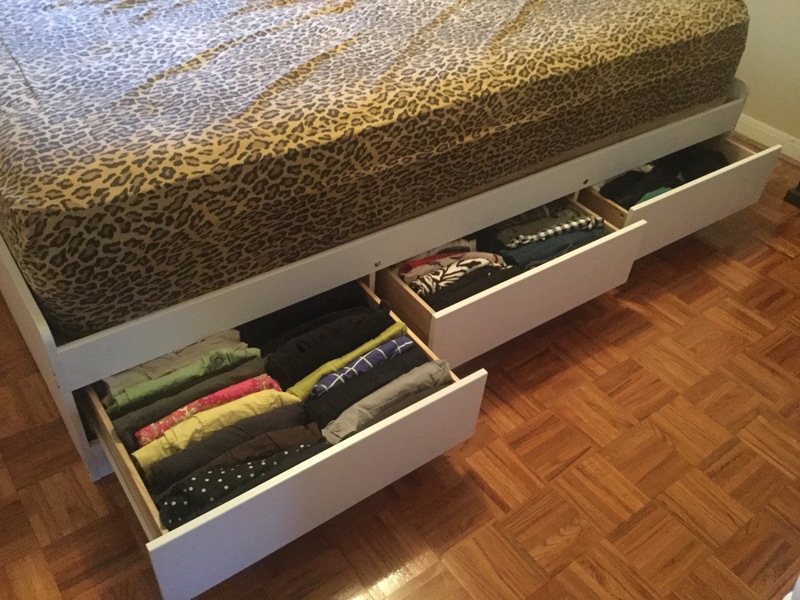 Here is a finished drawer. 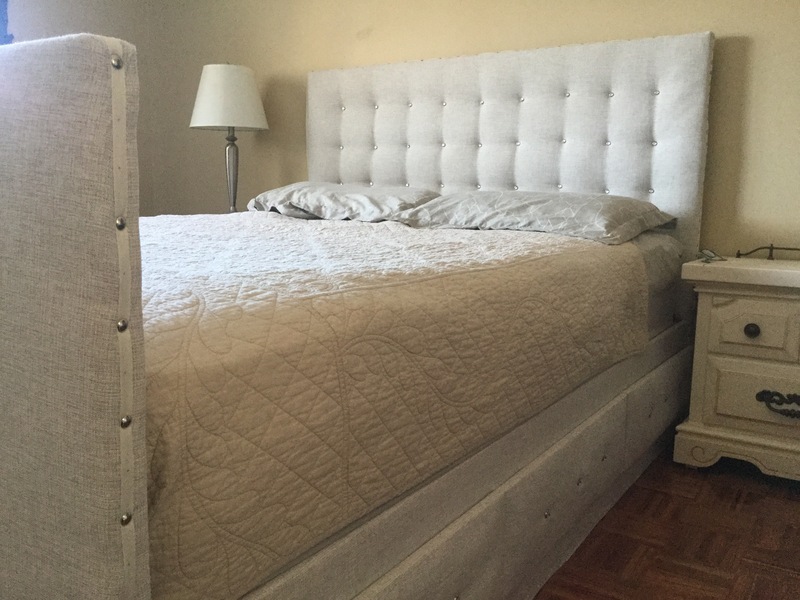 And… Here is the finished bed!! 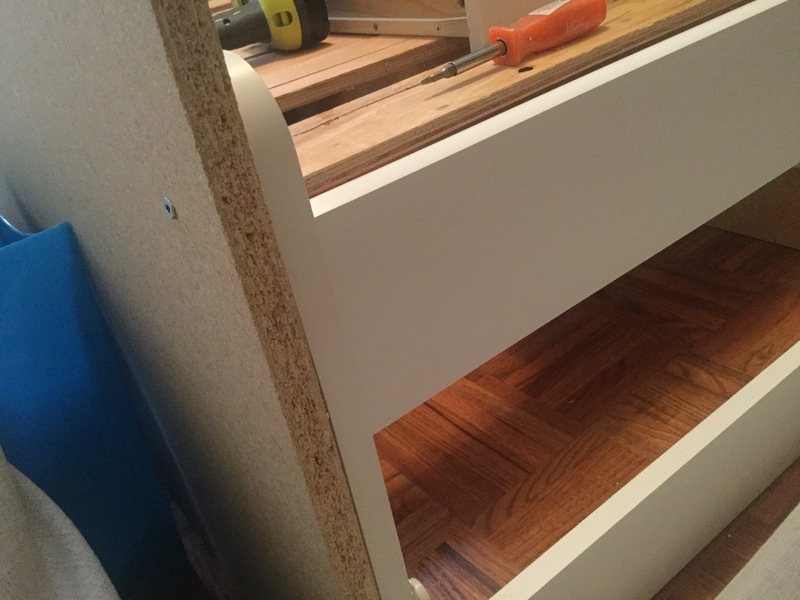 Well, it’s almost finished… I haven’t finished the drawers on the other side, and I need to add a lot more nail heads, but here is the almost finished bed!! The total cost of everything, including the bed frame, fabric, other materials, and the nail heads I haven’t bought yet, was about $600. Much better than $3000! Have a great family day long weekend, and happy Valentine’s Day!